Planting a garden provides food for the family. However, it is disturbing when the squash plants you have worked so hard to grow get yellow spots on the leaves. These yellow spots could indicate disease or they could indicate some other problem that you can easily solve or prevent in future gardens. Give your squash plants enough water. 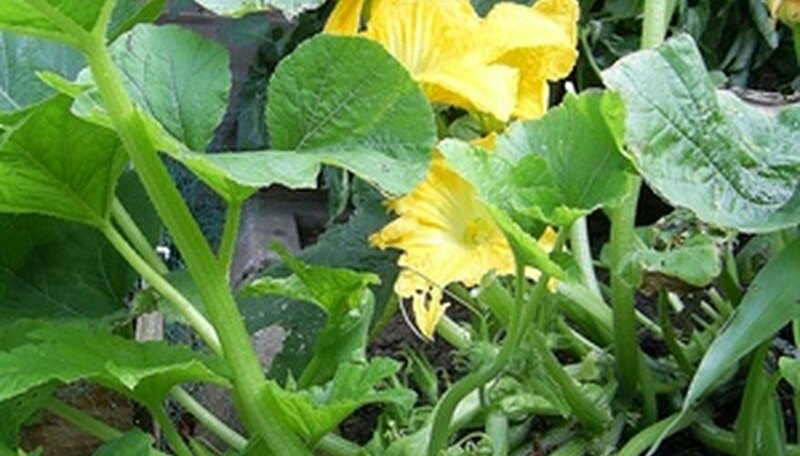 Although squash plants are fairly hardy in the heat, a lack of watering can cause the leaves to turn yellow. To prevent the leaves of your squash plants from turning yellow, make sure they get about 2 inches of water per week. If there is a lack of rain, plan on supplementing. You can either use a hose or sprinkler with fresh water or use old dishwater if your community is experiencing a drought. Empty the dishwater into a bucket each day and then water your squash plants. Make sure to water the base of the plants and not to pour water onto the leaves. You may need a little bit more water if the weather is exceptionally hot. Make sure to water in the early morning or in the evening to allow the plants to soak up the water before the hot sun can evaporate it. Too much water, especially in cooler weather can cause the leaves to yellow as well. Look for evidence of vine borers when you notice that your squash leaves are turning yellow. The leaves begin to yellow where it attaches to the vine first and then the yellowing works out to the rest of the leaf. You can also tell if it is a vine borer problem if you see vine sawdust at the base of the plant. Sometimes you can remove the bug and save the plant, but more often than not, the plant damage is too great to save it. Make sure your soil has the proper nutrients before planting your squash. The soil needs to have plenty of iron. Treat your soil with a fertilizer or compost before planting seeds or seedlings to prevent yellowing leaves. Too much watering can also deplete the iron in the soil. Keep your waterings to about 2 inches a week. If your soil is deficient in iron, purchase a liquid iron from your garden supply store and add that when watering your plants. Bacterial wilt is common in squash plants, which also causes yellowing in the leaves. To determine if your plant does in fact have bacterial wilt, cut off just a small piece of vine and split it open. If the “juice” inside seems more slimy than watery, it is indeed bacterial wilt. There are no cures for bacterial wilt. Remove the affected plants immediately to prevent the disease from spreading. You may also want to do some extra composting or fertilizing in this garden area and refrain from planting anything in that particular spot for a year.